Certain musical strategies can betray a Tim Berne composition. There’s the angular melody, played by the leader’s acidic alto, often in harmony with another horn, while the rhythm section tosses and turns beneath them. With the theme complete, two members of the band might engage in dual solos, with one of them eventually morphing from a free meter toward the tempo of the piece’s next written section, eventually cueing the whole band. It’s thought-provoking music that reveals itself slowly. If some of the trappings sound familiar after a nearly three-decade career, Berne is still finding ways to make them fresh. 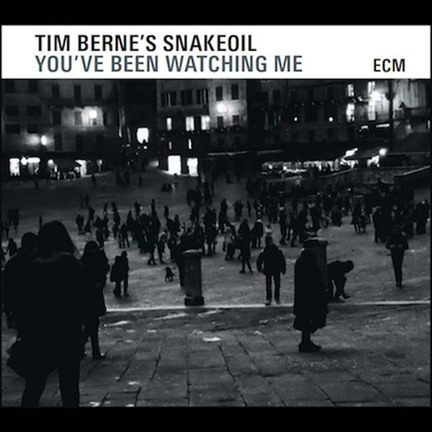 Snakeoil’s third album finds Berne continuing to assert his intense writing style under the ECM banner, with guitarist/collaborator David Torn handling the production for a second time and maintaining the saxophonist’s personality. The quartet of Berne, Oscar Noriega (clarinet, bass clarinet), Matt Mitchell (piano) and Ches Smith (drums) is augmented by Ryan Ferreira (electric and acoustic guitars). The guitarist makes a significant addition to the music, giving tracks like “Lost in Redding” more sonic edge beneath Noriega’s bass clarinet solo. Ferreira even becomes Berne’s frontline foil in “Small World in a Small Town,” a pairing that gets richer when drummer Smith switches to vibes, an instrument he also takes up on “False Impressions.” This track includes the most distorted six-string action on the album; contrast arrives in both volume and length with the title track, a two-minute-long piece for solo acoustic guitar. Previous Berne groups have focused on acoustic frenzy (Bloodcount) and dabbled in noisy electric structures (Science Friction). Snakeoil is poised to be his strongest band yet, because it combines those qualities.